I did not expect that. I really didn't. After all the success I'd witnesses, for it to end like that was- I don't want to call it shocking- but it was not even close to the way I'd predicted it to finish up. Those are basically the same thoughts I had after the Super Bowl and after hearing that Philip Seymour Hoffman died. An actor dying of a heroin overdose happens. Hell, people dying of a heroin overdose happens daily. It happens a lot more than anybody would like it to. I don't understand why it seems to continually happen to some extremely talented actors- Hoffman and John Belushi are the ones in my mind at this time- who appear to have, if not the world on a string, then at least have seen plenty of success and seem poised for more. But, as good as he was, I do want to encourage you to back off on a little of this gushing Hoffman praise. Somebody wrote on the Twitter, and I'm paraphrasing this, that “I can't think of another actor that went from comedy to leading man like PSH has done.” At which point I furrowed my brow and realized that this person can't be more than 23 years old, because when I think of “actor that went from comedy to leading man” I immediately think of Tom Hanks. 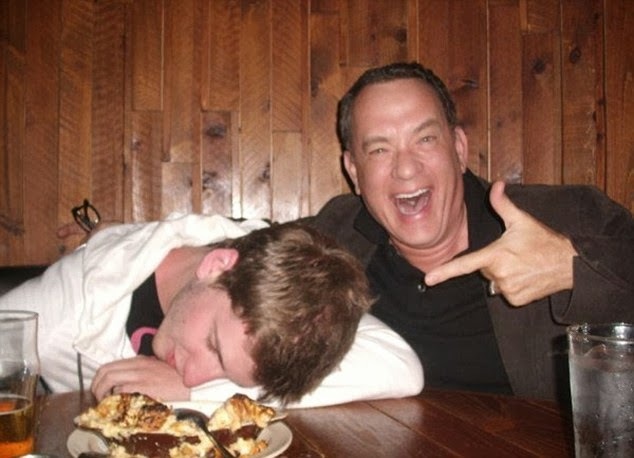 And because Tom Hanks isn't hopped up on H and dead (as far as we know), he's not getting his due. In case you've forgotten (or you're 23), Tom Hanks originally came to the attention of the country for starring in a sitcom where the entire plotline revolved around him and his co-star dressing up in drag to rent a better apartment. If you ever watched “Bosom Buddies” and thought for a second that the tall guy would end up winning an Oscar for anything, then you, my friend, should be a professional gambler. If you thought the guy that starred in “Splash” would win not his first, but his second Academy Award a decade later for playing a gay AIDS patient, then.... oh hell, let's be honest here, you didn't. Nobody did. Need I go on? “Hanx,” as he signs himself on Twitter (Really? Shortening your name by a letter? That's helping? ), is, by all accounts, a hard-working, clean, innovative guy who is not afraid to take chances. That's why the guy who starred in “Joe versus the Volcano” then took his co-star and went off and made “Sleepless in Seattle” and made everybody go, whoah, this guy can act! Then “Forrest Gump” and “Philadelphia” and “Apollo 13” happened. The first thing he directed is the also wildly underrated “That Thing You Do!” And I'll go to bat for the Hanx-produced “Band of Brothers” as being the best mini-series of the past 30 years. 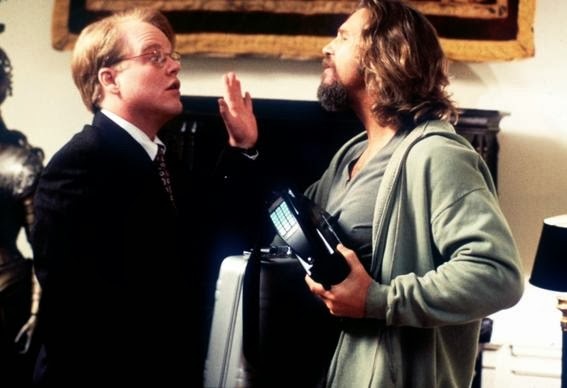 But because Philip Seymour Hoffman is dead and Tom Hanks is just at work starring in solid movie after solid movie (I'm guessing here, I haven't seen a Hanx movie in years) and is now finishing up another multi-part documentary called “The Sixties,” PSH gets lauded and Hanx gets ignored. That's not how it should work. And it also shouldn't work like that considering the Super Bowl and the fallout afterwards- and what isn't getting talked about. In fact, I'm allowing myself to think that this year's Super Bowl could even be dirtier than a used heroin needle, in a manner of speaking. I was having a discussion before the game and the conclusion we came to was that given two weeks to prepare, there was no conceivable way that Peyton Manning and the Broncos could score fewer than thirty points. None. Known throughout the football world for his pre-game work ethic, we believed Manning would absolutely find a way to beat the Legion of Boom. We figured the pick route and the underneath route would be the Broncos bread and butter all day long. Streak two guys down the sideline, force the corners and safeties to go deep, and “keep matriculating the ball down the field, boys.” Stretch the defense and make your living in the middle of the field. Four, five, six yards at a stretch. But the best laid plans of mice and men.... well, who expects a mis-timed snap on the first play from scrimmage and a safety? Denver was playing catch-up from 12 seconds on. Seattle set a Super Bowl record by leading for 59 minutes and 48 seconds. Now, that one play shouldn't mean anything. It's just one play. But I happen to be very good friends with a Chicago White Sox fan, and recently I saw a documentary on the 1919 White Sox, the infamous “Black Sox” that threw the World Series and has inspired many books and movies. Early in the series, the players involved had to give a sign to the gamblers that the fix was on. The White Sox were favored to beat the Cincinnati Reds handily (which is in part why the fix happened in the first place- the other was that they were woefully underpaid), and the starting pitcher for the Sox in the first game, Eddie Cicotte, was known for his pinpoint accuracy. So to prove that the fix was on, Eddie hit the first batter of the game on the second pitch he threw. To be extremely clear about this, it's all fanciful speculation on my part. It comes from being a baseball fan and watching a Black Sox documentary and wondering “how does this happen?” and then seeing one of the most prolific, precision offenses of all time fall apart in the biggest game of the year, truly from the first snap of the game. There hasn't even been a whisper of throwing games for years. Why teams of millionaires would throw games for a couple of grand and the real chance that they'd be banned for life is beyond me. But point-shaving still pops up in college basketball every couple of years. It gets swept under the rug pretty quickly because it's usually only one dude who got in with some gamblers and had to make it right lest he gets his legs broken or something Sopranos-ish. But it happens. And football, to me, seems to be teetering on the precipice of collapse. What with the billion-dollar concussion lawsuits and tons of money getting poured in from every which way... gambling becomes a problem when it appears that there's too much to lose. Football has an awful lot to lose right now. A young, energetic team with charismatic superstars that gets the talk away from concussions, and the major drug problems in the league.... well, that's who you'd like to have win the Super Bowl. Not an aging quarterback who's had four neck surgeries (that we know of), and a small, speedy wide receiver who will probably have to retire because of concussion problems sooner than later... need I go on about how Seattle represents the “new” league and Denver is the “old” league? It's in the league's best interests that Seattle win that game. And if the league pays Denver off to lose? Who's going to investigate that? Well, after I jokingly said “the fix was in,” I put it in the back of my mind and watched the rest of the game. And absolutely nothing Denver did the rest of the game made me not think that there was something more than a little fishy about the Broncos performance from start to finish. This is not to take away anything from what Seattle did. They played excellently and won the game. 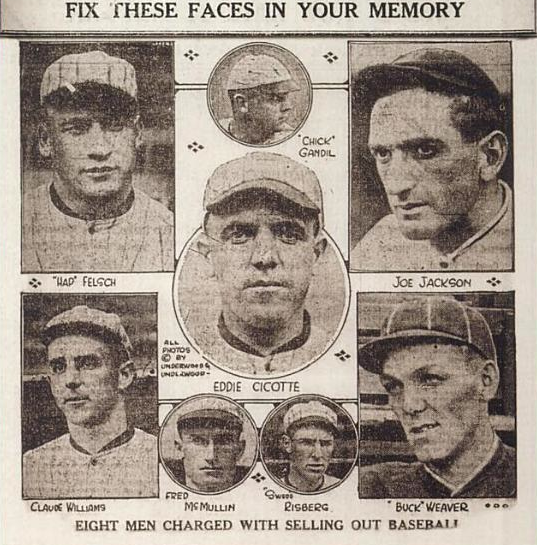 But the 1919 Cincinnati Reds weren't a bad team, either. They won the National League pennant, and they just happened to be the recipients of the Black Sox throwing the series. Again, this is all fanciful speculation on my part, and that's thanks to the conspiracy theory culture we live in nowadays. I tend not to believe in conspiracies. So many things happen coincidentally to us that work out, and we don't call those conspiracies. It's only a conspiracy when it goes against us, which is curious. The counter-argument to the fix theory is that I didn't expect Seattle to be that good, that Denver played their worst game of the season, and that I'm a 49ers fan. But even if all that's true (and it is), isn't the fact that the center snapped the ball over Peyton's head- and well over his head- on the first play of the game when he has snapped the ball to Peyton thousands of times this past season and knows that he's going to make a bunch of dummy calls before the actual snap- isn't that just a little too weird to let go by without a second thought? 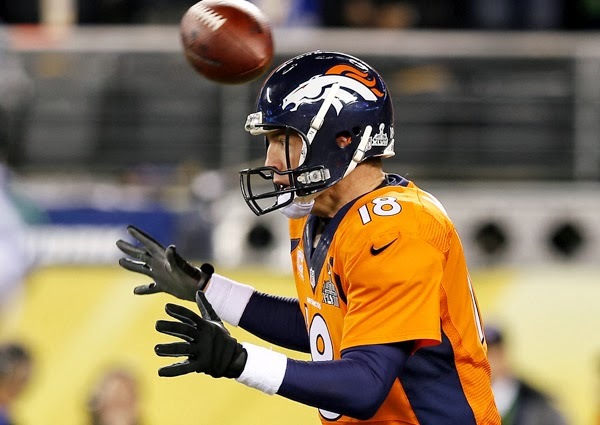 Nobody would expect Denver to throw the Super Bowl. Then again, I also didn't expect Philip Seymour Hoffman to die of a heroin overdose hours before kickoff. But one of them damn well happened, and if you might want to wonder a little about the other.